In the Third Reich, the law did not control the state; instead, the state controlled the law. The People's Court [Volksgerichtshof or VGH] is the best-known example in a series of new Nazi special courts that operated alongside the Reich courts, especially in the area of political offenses. In 1934, after four of the five men accused in the Reichstag Fire trial were acquitted, Hitler ordered the establishment of the People's Court, which henceforth dealt chiefly with cases of treason. Judgments were handed down by the senate of the People's Court (which consisted of two professional judges and three politically "reliable" lay judges) after brief, highly politicized hearings. The accused had no right of appeal. Between 1934 and 1939 alone, the People's Court heard 3,400 cases. Most of the accused were Communists or Social Democrats, and they were sentenced either to death or to prison terms averaging six years. After the beginning of the war, the jurisdiction of the People's Court's was broadened even more, and by 1945 it had issued thousands of death sentences. 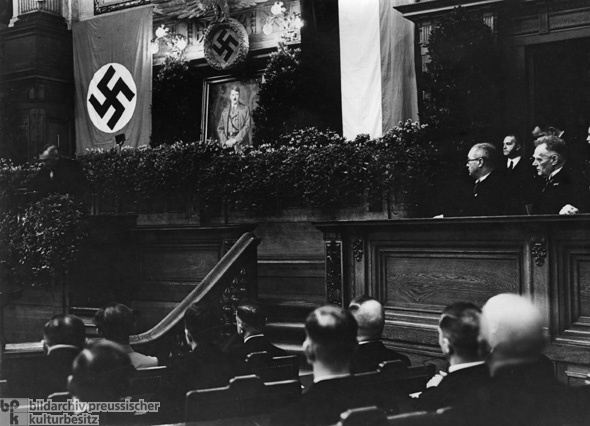 This photograph shows Minister of Justice Franz Gürtner delivering a speech at the opening of the first session of the People's Court in the former Manor House [Herrenhaus] in Berlin.